Featuring hand-painted floral motifs and gold-colored accents, this delightful set of three colorful bull figurines will brighten your home decor. Artisan Maribel Posso Olivares of Peru designs the black, light blue, and scarlet bulls, combining both Spanish and Peruvian styles. 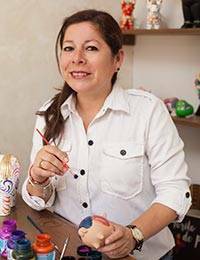 She was inspired to craft these figurines by the myth of the torito de Pucará, which recounts the story of a bull that brought water to a village suffering from a drought by piercing the side of a mountain with its horn.